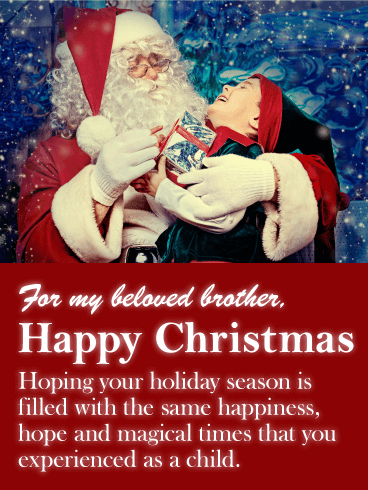 Send this upscale Merry Christmas card to your dear brother this holiday season, it will surely touch his heart. This card was well-designed with the elements of the season. It features frosty snow as a backdrop, perfectly placed Christmas tree branches, beautiful golden bulbs, silver bells, and bright shining tree lights. This exceptional Christmas card will send your brother a message of peace, love, and joy, and wish him a wonderful Christmas! 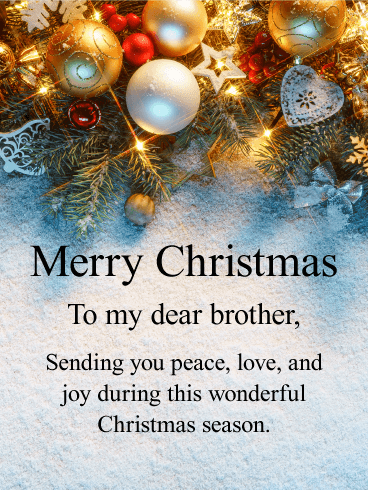 Merry Christmas - To my dear brother, Sending you peace, love, and joy during this wonderful Christmas season. 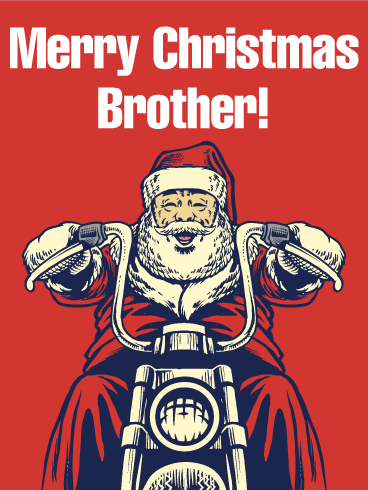 If your brother is an avid motorcycle rider, then there wouldn't be a more fitting card than this to send his way. This Christmas card shows a happy Santa riding a motorcycle instead of his sleigh, something only a true motorcycle lover can relate to. It features a classic retro style design, giving it a unique look. Your brother will truly appreciate that you sent a Merry Christmas card that looks like it was designed just for him! If you feel your brother is a fun awesome person, then you are in luck! 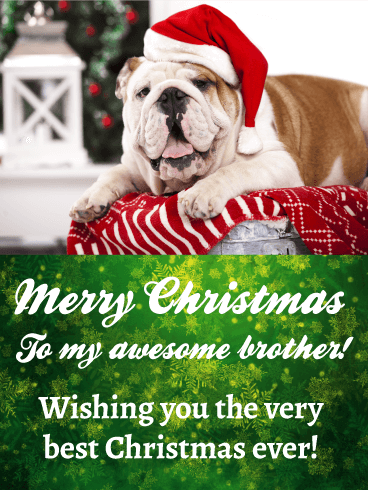 This Merry Christmas card features a fun playful design, and was made specifically for a brother that will appreciate a good laugh. A dog posing for his annual Christmas portrait will put a smile on his face, and make his Christmas more joyful. 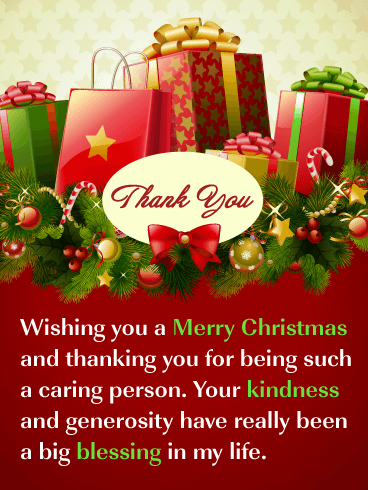 This Christmas card sports vibrant holiday colors of green and red, as well as a uplifting Christmas message. 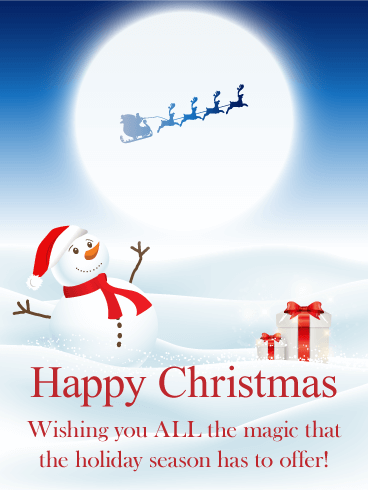 Wish your beloved brother a Happy Christmas with a card that will remind him of all the joys of Christmas. No one should forget all the happy and magical times they experienced when they were young, and this card will bring those memories back! The child sits on Santa's lap without a care in the world, so happy! This glittery gold Happy Christmas card will send a little magic to your brother's day! 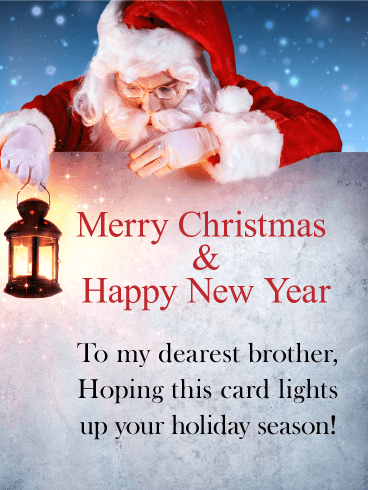 Let Santa light the way for your brother to have a Merry Christmas & Happy New Year! Santa is holding his lamp eagerly waiting to make someone's holiday season a great one. This Christmas card features stylish backgrounds of blue and gray, along with a classic Santa. Your brother will be thrilled to receive this endearing card, and will appreciate your thoughtfulness. 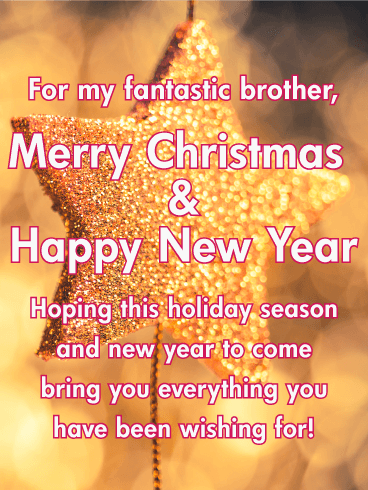 Send your fantastic brother this spectacular glittery card that will add brightness and joy to his day during this holiday season. This card will wish him a Merry Christmas and a Happy New Year in style! It features a gold sparkling star with gleaming lights flicking in the background. Your brother will be touched that you took the time to send him the very best card. 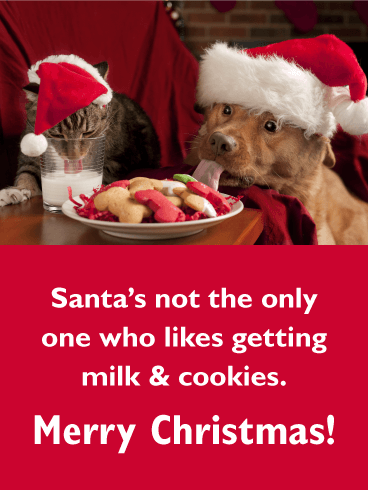 So send this card on its way to wish him a very happy holiday! Missing your brother this Christmas? 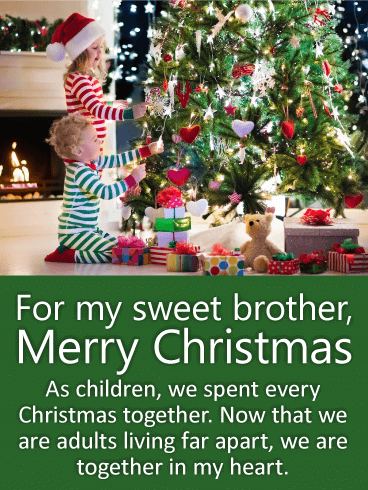 If so, then let him know how much he means to you with this Sweet Brother Merry Christmas card. It's no wonder why you miss him during the holiday season, as kids, you spent every Christmas together. The card features a brother and sister enjoying Christmas day, a scene that is sure to bring back fond memories. This colorful image contrasts well with the striking blue background! The Christmas season is a magical time of the year. Some think this only applies to children, but as adults, all you have to do is believe! 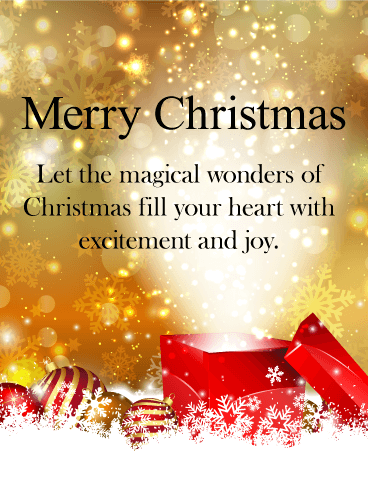 This special Merry Christmas card has an enchanting feel that captures the magic of Christmas. The golden starry sky, pure white snow, and miraculous light shining brightly out of the red Christmas present, all bring you the essence of the wonder of Christmas. This card will be enjoyed by everyone who sees it! 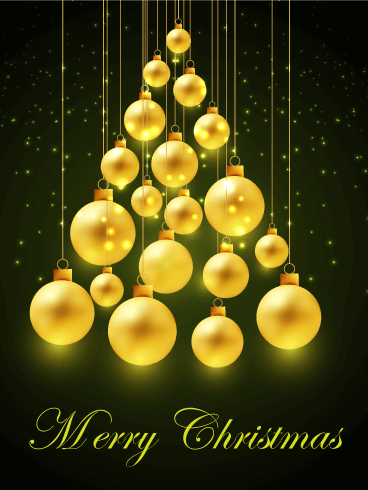 This Merry Christmas card displays golden ornaments that are carefully placed to form one of the most symbolic images of the holiday season, the Christmas tree, a symbol that captures the hearts of young and old alike. These glowing ornaments look stunning against the dark starry sky. If you have a loved one, friend, or coworker that you are thinking of this holiday season, send them the very best and wish them a Merry Christmas today! 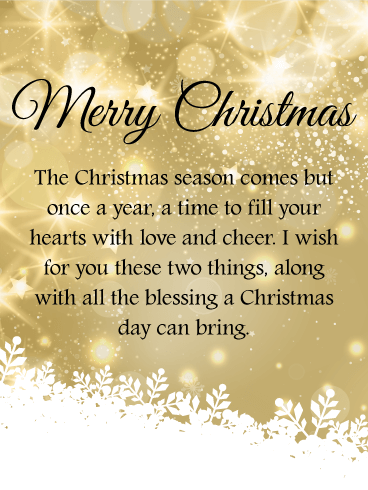 A beautiful poem wishing holiday blessing and cheer, make this Christmas card suited for the ones you hold so dear. This Merry Christmas card was designed with a golden starry sky and twinkling lights above a snowy winter scene, it is a wondrous sight indeed! The snowy white leaves are a lovely touch, especially for those who won't have snow this Christmas. Send a little snow and beauty to your friends or loved ones this holiday season!